Work: Elected to the provincial Assembly, 1764-69; Member of the Committee of Correspondence, Committee of Safety,1773-76; Elected to Continental Congress, 1775-77. Little is known about George Taylor. He was a working man and little concerned with politics, though he acted in service to his nation when called. He was born in Northern Ireland and emigrated to America in his early twenties. He was an Ironmaster at the Warwick Furnace and Coventry Forge. Later he and a partner leased an iron furnace in Bucks County. Iron production was his principal concern all of his life. 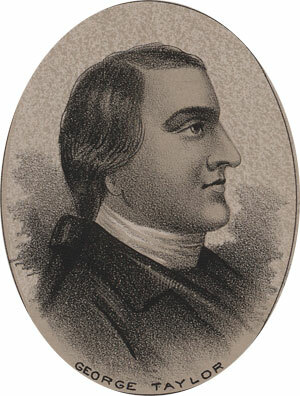 Taylor was elected to the provincial assembly for Pennsylvania in 1764, and was reelected for five consecutive years. He was a member of the committee to draft the instructions of Pennsylvania delegates to the first Continental Congress, a member of the Committee of Correspondence, and of the Committee of Safety. In 1775 he was appointed to replace a member of the Pennsylvania delegation who refused to support Independence. He arrived too late to vote, but did sign the Declaration. He served Congress through 1777. He was then elected to the new Supreme Council of his state, but served for only six weeks, apparently due to illness. There is no record of any public service afterward. He died in 1781 at the age of 75.